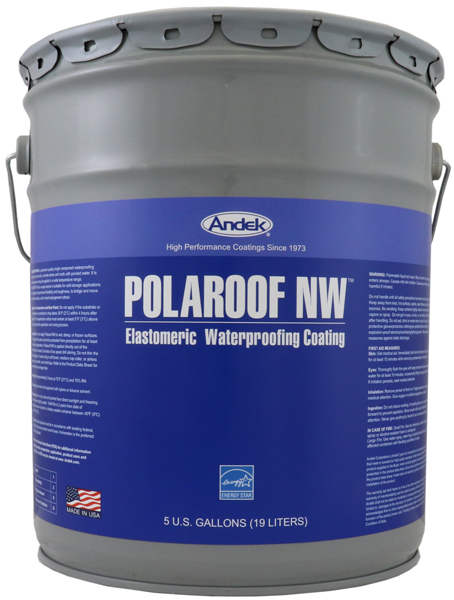 POLAROOF NW is a premium quality single component waterproofing coating for metal roofs, concrete decks and roofs with ponded water. It is solvent-based so may be applied in a wide temperature range. POLAROOF NW as a vapor barrier is suitable for cold-storage applications. It is designed for permanent flexibility and toughness, to bridge and move with hairline cracks, and to resist impingement attack. Produces a fully adhered, seamless, high density, waterproofing membrane that is totally vaporproof (may be used as a vapor barrier). Protects substrate against rust, corrosion, UV damage, acid rain, and fungal attack. Easy to apply straight out of the container by brush, roller, or airless spray. May be used on vertical, pitched, and horizontal surfaces and withstands ponding water. Remains flexible, tough, and weatherproof at low temperatures and will not flow at high temperatures. Surfaces must be dry, free of dirt, loose debris, oils, grease or any substance that could interfere with adhesion. Do not apply if the substrate or air temperature is predicted to drop below 35°F (2°C) within 4 hours after application. The application surface must remain at least 5°F (3°C) above dew point during the application and curing process. Do not apply Polaroof NW to wet, damp, or frozen surfaces. Do not apply if the area cannot be protected from precipitation for at least 4 hours after application. Polaroof NW is applied directly out of the container after at least 2 minutes of low speed drill stirring. Do not thin the product. Apply in 2 coats using a soft brush, medium nap roller, or airless sprayer in a smooth, even technique to achieve a uniform coating thickness. Approximately 3 hours at 70°F (21°C) and 70% RH.